This pump work fine. Unfortunately the velcro piece is so short it will not got around frame of bike. Really? for a 40 dollar hand pump could they have spent another 10 cents and given us more than a 4inch piece of velcro? Did they test the attachment with any road bike to see what would happen? I actually took it to a bike shop to see if I was missing something, but no they could not figure it out either. They ended up selling me a bigger piece of velcro. Ridiculous. The velcro on these pumps is meant to secure the pump to the bike-mount, which mounts under your bottle cage with the same hardware, which is why it would most likely be too short to wrap around a bike frame. If there's anything we can do to help you out with the pump please let us know by phone or email! This is great little light weight pump that is able Pump to road bike tire pressure . More confidence in a saddle bag than CO2. 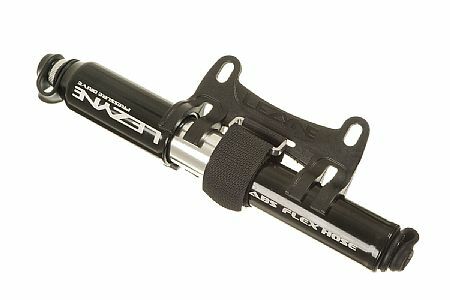 The Lyzene Hand Pump is solid and user friendly and is small enough to put in a medium seat bag. It takes up about the same space as 2 CO2's. The flexable tube and quality are what sets this pump apart. I have Lezyne pumps on all 5 of my bikes. These pumps are small, light and very well-made. Look nice, too. I like the bottle cage mount, too. The hose which is stored inside the barrel rattles continuously. Drove me crazy. Had to return it. The pump is light and fairly efficient for a bike pump. The nozzle is connected to a hose and the hose screws into the pump. The hose then screws onto either presta or schraeder valves. Ive used it once and it worked well. I'm a fan of these pumps-they're rugged, they last and the design allows you to inflate even if you have a tube with too short a valve stem. It does help to read the directions for the details to maximize their effectiveness. Without a pressure gauge it is difficult to tell the exact pressure, but from years of squeezing the tire experience, I'd way that this pump can reach at least 110 psi. It is the best compact pump I have ever used. On a recent ride, a friend's Specialized frame pump wouldn't work and he used a CO2 cartridge from another rider. Blew out his tube! I gave him a spare tube and handed him my Lezyne Pressure Drive Hand Pump. He chuckled at its size, but had nothing but praise when he used it. He was amazed at the amount of pressure - he figured it had to be over 100 psi when he stopped. Great pump, works as described. Easily able to achieve high (110) psi in my road tires. It's a bit long to keep in a rear jersey pocket (which I do), but, the frame mount works well. Best small pump I've ever bought. This is my second Lezyne pump. The first one is on my 'brevet' bike. This one goes on my 'road' bike. It is very well constructed of light materials. And the design works great. No more one shot cartridges for me. I've got reliable inflation anytime. Compact, great seal to stem for both types. I love this because it fits easily in my fanny pack for commuting, so I don't need to worry about anyone swiping it off of the bike when I park it during the day. Also, it has a great flexible connector for both types of stems, so I can use it for both of my bikes, and the flexible connector means that I can actually pump with both hands free without having to worry about yanking it off of the stem. Excellent pump - I really like the flexible connection, it makes pumping up a tire/tube much easier than my previous model, which required one to hold one hand steady - which is not so easy to do. Compact, emergency pump. Don't expect to get 100PSI from it. Had to only used it one time so far, it has a advertising of pumping up to 120PSI but could only get 80 from it. Just a typical back pocket pump. On presta valves with a removable valve core: Before use with pump, remove valve core and apply small amount of LOCTITE thread locker to valve core threads. Reinstall valve core and securely tighten. To use this pump, you screw on one end of a flexible hose to your tire valve stem and the other end to the pump. After pumping when you remove the hose it rotates the same direction as unscrewing a removable presta valve core. Your valve cores will want to unscrew with the flexible hose instead of staying in the stem. You may need to use pliers to unscrew the core from the hose and it is easy to damage the small rubber seals on the valve core. Even if you LOCTITE your own valve core stems it could be disastrous to loan this pump on the trail because another rider's valve core stem could get jammed in your hose, which leaves them without a valve core, and renders your hose and pump unusable until you can unscrew their valve stem. The pump has unscrewed valve cores in several my Kenda and Q-Tubes brand presta tubes, I can't trust taking it out on the trails with my MTB. I don't know of any problems using this pump with schrader valves but that's not what I bought it for. A few of us here use these Lezyne pumps and, in our experience, Loctite Threadlocker is not necessary if the valve cores are securely installed. Removable cores can be tightened with a core tool, or even a pair of needle-nose pliers. If you are going to use a Loctite Threadlocker on a valve core, the Blue 242 is most appropriate as you will want to be able to get the core out later. And be careful not to Loctite the core shut! One might also consider buying tubes without a removable core if this is an issue. We also tend to thread the hose onto the pump first. This may reduce some of the strain and twisting on the valve. I use the pump to inflate tires on the road. I don't normally check pressure after repairing a flat but the pump does seem to be able to achieve high pressure as advertised. I like the small size and efficiency of the pump and I'm completely satisfied except for a couple of minor points 1)the rubber dust cover gets in the way when when inflating the tire and 2)the pump tends to rattle a bit if it's not fastened down snugly. Great bike pump, light, compact, and very functional. I really like this pump and wish I had bought it before the others. It's light and extremely easy to use. The hose screws into the pump and doesn't rattle, then unscrews and attaches outside for easy use. It came with a frame bracket which I put on one bike, and I keep it in my jersey pocket when I ride the other. I've had other pumps snap my valve stem because they connect right onto it and they heat the stem up when trying to get to 100psi. I've had to use this pump several times and it works well, though as other reviewers mention, it does take some physical effort to get your tire to a point where you can ride. compact, powerful, and easy to use. I'm a recreational rider and use my bike for short commutes and for fun. It's nice to have a light, easy-to-use pump to take along for topping up tires or contending with possible flats. I often lock and leave my bike where something like a pump should definitely not be left on the frame. One thing I especially like about the design of this pump is that it is easy to slip from the frame and carry along with me when I've arrived at my destination. By far the lightest and most functional framepump with hose-attachment efficency and the power to get over 100psi.